We’d love your help. 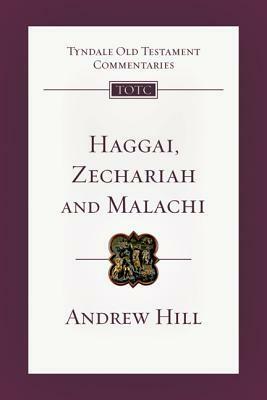 Let us know what’s wrong with this preview of Haggai, Zechariah, Malachi by Andrew E. Hill. To ask other readers questions about Haggai, Zechariah, Malachi, please sign up. Daniel is an Old Testament commentary, written byErnest C. Lucas published by IVP Academic. It has been a long time since a mildly-conservative critical, yet highly scholarly work has been published on the Book of Daniel and Lucas did not disappoint, weighing in at almost 360 pages. This commentary is the newest edition of the Apollos Old Testament Commentary Series with editors David W. Baker and Gordon J. Wenham, a series which is synonymous with excellent exegesis and superior application, thi Daniel is an Old Testament commentary, written byErnest C. Lucas published by IVP Academic. It has been a long time since a mildly-conservative critical, yet highly scholarly work has been published on the Book of Daniel and Lucas did not disappoint, weighing in at almost 360 pages. This commentary is the newest edition of the Apollos Old Testament Commentary Series with editors David W. Baker and Gordon J. Wenham, a series which is synonymous with excellent exegesis and superior application, this volume continues this legacy, but does not propel it to new heights. This volume is one of the weaker volumes in the series, but to its less than anticipated conservative approach. Yet while Lucas answer the critical issues yet he yielded to far left critics on many issues such as date and historical reliability of the kings and rulers of Babylon. While this is an issue, do not dismiss the work completely rather use it with discernment, for while it it critical it does produce some great thought provoking exegesis and well informed applicaiton. Daniel has two main sections the typical general introduction, and then followed by a insightful exegetical commentaries on this partly historical and partly prophetic book. With regard to the general introduction it is the typical study into the introductory matters of the book and how they relate to the Bible as a whole. This is a serious scholarly work which dives into contextual as well as the as the different methodical approaches to study of this book Lucas takes great care in carefully showing the original context of passage while applying it directly to the modern day reader. He also uses his own translation of the Hebrew text, which demonstrates his depth of knowledge of the text itself. While I disagree with Lucas on a great many major and minor issues with regard to Old Testament interpretation, the arguments he makes are intriguing and brought up new ideas I had never considered before. Lucas is innovate in his interpretation and application while staying mostly in the realm of orthodoxy. In the vein of recommending, Daniel , to others I would recommend this commentary to some pastoral and all scholars, but to the pastor I again suggest that this work be used with discernment. There are many commentaries about the book of Daniel available at this moment but Daniel of the Apollos Old Testament Commentary series is a very scholarly works worthy of your time. This book was provided to me free of charge from IVP Academic in exchange for an unbiased, honest review. Since Mr. Hill already has written a volume on Malachi in the Anchor Bible series, a series known to revel in minutiae, I feared that this volume might have tro Here is another fine entry in the highly respected Tyndale Old Testament Commentary series. This is a replacement volume for Baldwin, so this title has big shoes to fill. I was immediately surprised by the size of the volume coming in at 368 pages. Apparently the series editors felt comfortable giving Mr. Hill the space he felt he needed.